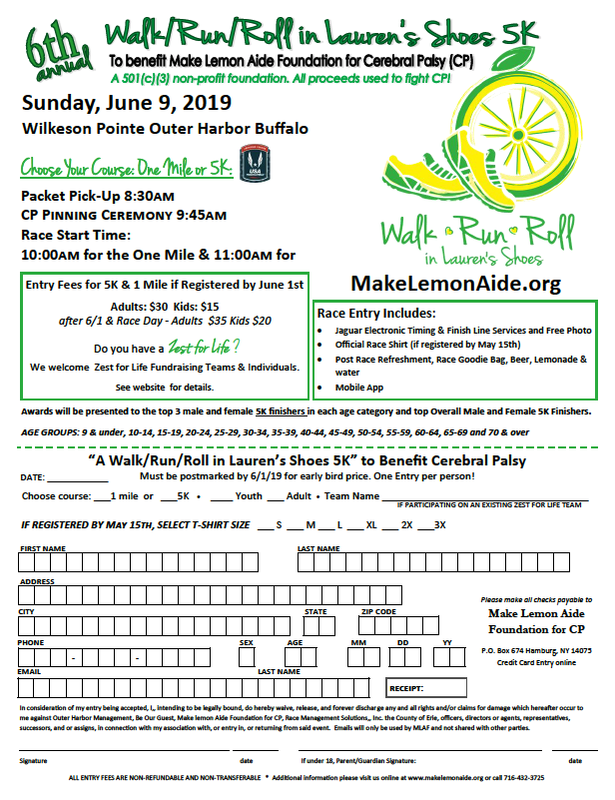 Please join us for the 6th Annual Walk/Run/Roll in Lauren’s Shoes 5K & 1 Mile Honorary CP Walk on Sunday, June 9, 2019 at Wilkeson Pointe. Individuals of all abilities are invited to participate, including those with wheelchairs, walkers, and strollers. For a unique twist, you can choose to wear ankle weights to simulate what it may be like for someone living with cerebral palsy (CP). Early packet pickup: Saturday, June 8th from 10 a.m – 2:00 p.m. at Wilkeson Pointe in front of the Longboards Paddle Co.
Raceday registration and packet pickup @ 8:30 a.m.
CP pinning ceremony @ 9:45 a.m.
1 mile walk starts @ 10:00 a.m.
5k run starts @ 11:00 a.m.
5k awards and top fundraisers announced @ 12:30 p.m.
For CP families, “I Walk/Run/Roll for CP Warriors” signs will be available (limit 10 per family). Our inspiration-driven fundraiser, Zest for Life, is about the virtue of courage and embodying positive energy through motivating challenging tasks. Those who have zest exude enthusiasm, excitement, and energy. Our Zest for Life campaign fundraising effort empowers all individuals – from any walk of life – to improve quality of life for someone living with Cerebral Palsy. Whether or not you participate in the race, your donation – and your story – makes a difference. Receive the feeling of zest within for helping others. Visit the Walk/Run/Roll in Lauren's Shoes fundraising page to set up your individual or team fundraising page, set your fundraising goal, and tell your personal story. Need help registering for the race or fundraising? Download our step-by-step guide (pdf). 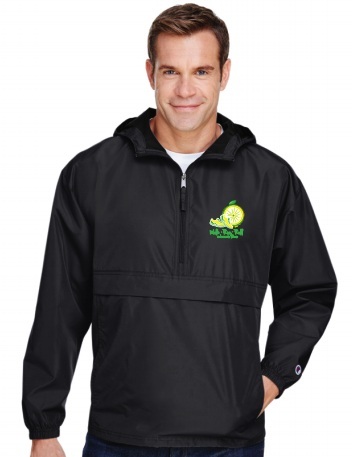 Team Captains – create your Zest for Life team fundraising page now and earn great prizes. Get started on your fundraising today. The top three team fundraisers will be awarded amazing prizes on race day! This year's Walk/Run/Roll in Lauren's Shoes will return the Wilkeson Pointe at the Buffalo Outer Harbor. The scenic course will take you along the waterfront on the bike path. After the race, stay and enjoy the rain gardens, sculptures, and beach. You can also stop by Long Boards Paddle Company for paddle boards and kayak rentals, or cool off with a drink and food at the Consumer’s beer garden. As part of our commitment to inclusion, our smooth bike path race course is full accessible for wheelchairs and other supportive devices. We run for them. We run with them. CP is the most common motor disability for children – one that can make talking, walking, and other everyday tasks a monumental challenge. Yet there is no federal funding for CP research. But with your help, we can give hope to those affected by this forgotten disability. The Walk/Run/Roll in Lauren's Shoes wouldn't be possible without generous sponsors. If your business or organization is interested in joining the fight against CP, download our sponsorship form. Coming soon. Add your organization here!